Acupuncturists use thin, sterile, stainless steel needles that do not hurt when they are inserted. There are points in the body, that when stimulated, decrease pain and promote an overall sense of well being. 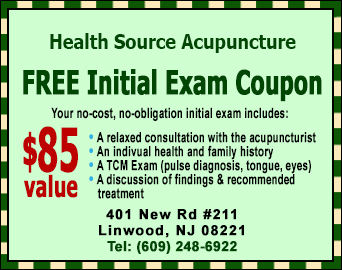 Linwood, NJ acupuncturists are trained individuals who have completed extensive classroom and clinical hours in order to become certified to treat patients. Shoulder pain is another difficult to treat illness because of the complexity of the shoulder joint. The shoulder is a ball and socket joint, attached together by ligaments and protected by cartilage. If there is ligament damage or the cartilage has worn down, the joint will hurt when it is used. It is one of the body parts exposed to the most repetitive use, repeated traumas and degeneration, so athletes, laborers and aging adults are most susceptible to shoulder injuries of all kinds. Those that suffer from arthritis will likely find relief from acupuncture treatments because acupuncture treats the whole body and promotes overall wellness. Arthritis sufferers likely have arthritis in more than one place and analgesics only help for so long. There is no need to be in chronic pain when acupuncture treatments are available. You will not know how acupuncture can affect your chronic pain until you try it. Although it may not work for everyone, acupuncture is free of side effects and certainly worth an attempt at dealing with your pain.